Injuries to the fingertips are very common. The injury can range in severity from a minor laceration to a complete amputation and can occur from a misplaced hammer strike, a crush in a car door, or a laceration from a sharp object. Early treatment of fingertip injuries can improve the results. The fingertips are critical for hand function, as they are highly specialized parts of the body with thousands of sensory nerve endings. The human hand is amazing, allowing us to delicately paint a picture, gently hold a young child, and powerfully swing a hammer. It is not surprising that an injury to this area can significantly affect our lifestyle and livelihood. Possible complications from fingertip injuries include infection, finger stiffness, nail deformity, decreased sensation, hand weakness, and persistent pain. A hand surgeon and hand therapist can help improve the outcomes. The treatment of the fingertip injury depends on which structures are damaged and the severity of the injury. Any component of the fingertip is at risk for injury including the skin, nail, bone, and nerves. First-Aid: The wound should be cleaned with running water as soon as possible to prevent infection. Once the wound is cleaned, holding pressure using a clean bandage and elevating the hand above the heart should stop the bleeding. If the bleeding does not stop after 10-15 minutes with direct pressure, there is deformity to the finger, or limited range of motion, you should seek medical attention. Prompt treatment can improve the long-term result. If the wound is contaminated or the patient has risk factors for infection, oral antibiotics are commonly prescribed and tetanus immunization is updated. Skin: Skin lacerations are common and are repaired with sutures when possible. In some cases, there is a loss of skin and subcutaneous tissues, and the skin edges cannot be brought back together. Usually a defect in fingertip skin will heal on its own with daily wound care. The fingertip has a remarkable ability to heal, and new skin can regrow to repair the wound in a few weeks. In some cases, a skin graft or tissue flap surgery is needed to cover a larger area of tissue loss. Nail: Nailbed injuries involve the tissues which produce the fingernail, the nail matrix. The nailbed matrix is repaired by removing the nail plate, suturing the damaged nailbed tissue, and replacement of the nail on top of the repair, if possible. Dissolvable sutures are recommended for suturing nailbed tissue. The goal is to re-align the nailbed matrix so that there will be less chance of scar tissue formation within the nail, to improve the growth and appearance of the nail. 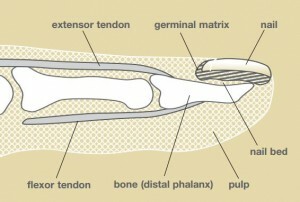 Bone: Fractures of the bone (distal phalanx) are common after a fingertip injury. Most of these types of fractures are stable, and do not require surgical treatment. Splinting the fingertip for a few weeks is usually recommended to protect the fracture site during the healing process. If a fracture is unstable or significantly displaced, surgery can be used to realign and stabilize the bones. Temporary pins are typically used to hold the bones in place while they heal. This procedure is performed in the operating room as an outpatient. Nerves: Sensory nerves in the fingertip are very small and are usually too small to repair surgically. Numbness, tingling, and hypersensitivity are common after a fingertip injury. In most patients, however, the nerve endings regenerate and the sensation improves gradually over time. Most patients with fingertip injuries are able to return to work, sports, and hobbies after a few weeks of treatment. Recovery time is variable depending on the type of injury, possible complications, and pain tolerance of the patient. It may take 6 months or so for some patients to feel “back to normal”. After a fingertip injury, many patients experience pain, swelling, and sensitivity at first, but they gradually improve over time. Fingertip hypersensitivity and scar tissue can be improved with hand therapy treatment. Some patients notice that the fingertip feels swollen, numb, and tender for several months, and they have increased pain in cold weather. The fingernail will often fall off after a severe injury. Most fingernails will grow back after about 3-4 months. At first, there are ridges and deformities in the new nail, but most nails look better 6-12 months after the injury. The amount of the initial trauma to the nailbed usually determines the final appearance of the nail. Complications of nail growth can be treated surgically if they occur. What can be done to improve the results? Rest and elevation of the hand to the level of the heart is important for the first few days to reduce swelling. Gentle range of motion exercises in the uninjured fingers can reduce overall hand stiffness. Hand therapy with an occupational therapist (OT) or physical therapist (PT) trained in hand care can help decrease swelling, scar tissue, and nerve sensitivity and increase hand range of motion, strength and, function. Consultation with a hand surgeon can be important to provide the patient with various treatment options tailored to his or her needs.